Good variety of period photographs; interesting text with “first-hand” accounts; detailed drawings in 1:72, 1:48 and 1:32 scales; competent artwork showcasing 9 aircraft. A welcome publication that gives the modeller a good understanding of an aircraft that performed well in numerous campaigns despite its outdated appearance. This A4 sized publication is number 48 in the Kagero Monograph series and there are 76 pages between the soft card covers. The narrative begins with an introduction to the concept of dive-bombing and the role of close support aircraft in World War One. Design and development of the Henschel offering follows, before the reader is introduced to the various prototypes. From the V-4 airframe, came the A-0 production version. In the latter half of 1936, the slightly modified A-1 made its appearance and the following year, a few B-1s also rolled off the assembly line. In total, over 250 examples of all types were produced before production ended in 1938. 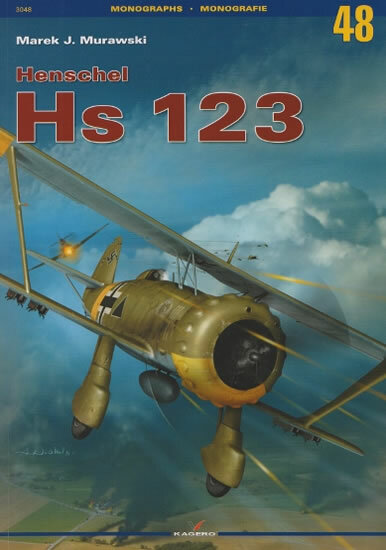 The Hs 123’s service record through the pre-war period is discussed, as the aircraft experiences combat for the first time with the Legion Condor. Experiences during WWII follow where sections are devoted to the campaigns in Poland and the West, Operation Marita - in the Balkans, Operation Barbarossa – the attack on the Soviet Union, and the continuing dramas on the Eastern Front from 1942 – 1944. Its Foreign Service use is also covered with a look at examples that went to Spain and China as well as the unrealized export plans to Austria. To give a sense of perspective, numerous “first hand” accounts are interspersed throughout the narrative which are always a welcome addition. A technical description covers various aspects of the airframe, power-plant, and armament. Despite a couple of hiccups in the translation, it does make for an interesting read. As expected, scale plans are a major feature of these monographs. There is a lift-out that contains 1:32 scale drawings which cater for both the Hs 123A-0 and A-1. Cross sections have been taken at various points of the airframe with extra enlarged views of the pilot’s seat and BMW 132A engine. More drawings can be found inside the book, this time in the popular 1:48 and 1:72 scales (as above but now including the B-1). These are contained over 15 pages and include more illustrations of the engine as well as numerous structural details. Particularly helpful are the greyed out sections of airframe which highlight the differences between each version. An interesting collection of photographs is also available to the reader. Most are published 2 per page so that as much information as possible can be gleaned from each image. Unfortunately the reproduction process has taken the clarity out of many of them. There are 9 aircraft profiles that present a wide variety of colour schemes. 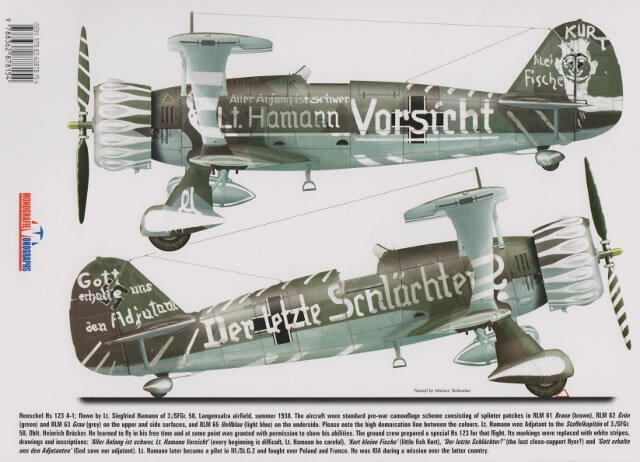 The artwork is exceptional and should whet the appetite of modellers and decal manufacturers alike. A table presents the obligatory specifications while another lists the losses suffered by Schl.G 1 between 1 January to 31 August 1942. Overall it’s quite a comprehensive publication that gives the enthusiast a good understanding of this rugged and reliable aircraft.